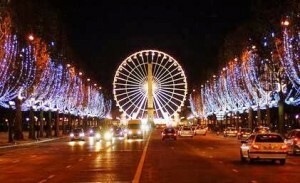 Champs Elysées in Greek mythology means “the place where the heroes stay afterdeath”. Do you want to know why? Champs Élysées have become the main avenue of Paris. Finished for the first time in 1724, the avenue was promoted to connect directly the Place de l’Étoile (now named Etoile-Charles de Gaulle) with the Concorde square. Back to our era, in 1994 the Champs Elysées suffered a deep modification, reaching now the incredible length of 1910 meters and, with the Avenue of the Grand Armée which kind of extend the Champs Elysées beside the Arc of Triumph, they both reach a total length of 7 kilometers, connecting in this way, the center of Paris with the financial district of La Défense. At the end of the avenue you can find one of the major monuments of Paris, the Arc de Triomphe. You can visit the roundabout of the Charles de Gaulle square as well as climb up the monument, from where you will discover an amazing view of the city. The Champs Elysées are nowadays a worldwide reference, as the Champs (as the Parisians call them) welcome shops from the most famous brands, engaged in a deep competition to gain access to this trendy location and expose their products or services along the historic avenue. It is a special place to go shopping while relaxing and enjoying a great time wandering in the street. Last but no least, the Champs Elysées are the place where all major parades are taking place: not only does the French Army parade on it for Bastille Day, but it’s also where the Tour de France, most important cycling race in the world, has its finish line. 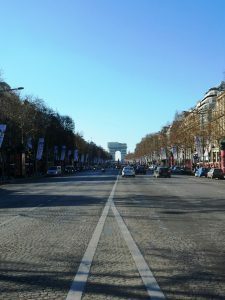 The Paris Marathon usually also passes by this magnificient avenue. If you wish to walk along the whole avenue, prepare to walk almost 2 kilometers. Wear comfortable shoes! With a few exceptions, the shops of the Champs Elysées avenue are opened all week long, usually from 10 am to 8 pm, while the Arc de Triomphe is opened until late at 10 pm. If you are interested in upscale shopping at the best world brands, no doubts, come to the Champs Elysées! From Louis Vuitton, Guerlain, Cartier, to Zara, H&M, Sephora, the Disney store, not forgetting of course the store of the football club PSG, you are sure find what you are looking for. But that’s not all: you will also find there art museums (Grand Palais and Petit Palais) in the middle of the avenue, close to the roundabout Franklin Roosevelt; green spaces where to relax and maybe grab a snack; and of course great architecture and monuments to admire, along the avenue and at the Concorde Square. And if the weather is not with you and you wish to relax at the cinema, the Champs Elysées also have 4 movie theatres where you can see a movie in English with subtitles in French (choose the ones with the indication “VOST”). Last: you call also find several clubs on or close to the avenue, the Queen being one of the most famous ones. in the side streets, and it would be a pity to reduce your discovery of the neighborhood to the only Champs Elysées. At ParisByM, we have designed a discovery itinerary to help you make the most of your time there which is included in most of our packages. Access: “Champs Élysées-Clemenceau” metro line 1 and 13. “Franklin D. Roosevelt” line 1 and 9 “Charles de Gaulle- Étoile” line 1, 2 and 6. “Concorde” line 1 and 12. Located in the northern part of Paris, the Montmartre neighborhood is famous for its bohemian streets, its historical night life, and its main and most significant monument, the Sacré-Cœur, which is located on the top of a 130 meters hill. The Montmartre neighborhood is famous for being home to the pioneers of the avant-garde movements during the 20th century. Artists like Van Gogh, Picasso, and Amedeo Modigliani lived in this iconic district of Paris. A guided Montmartre tour will not only show you the lively streets and the cultural environment, but it will also give you hints about what is hidden behind the close doors… You will for instance pass by the house in which Picasso lived and painted his famous masterpiece: Les Demoiselles d’Avignon (1907). 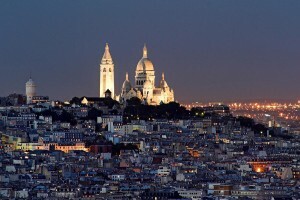 In addition, Montmartre has one of the most important monuments in the city – the Sacré-Cœur Basilica. Located at the top of a 130 meters tall hill, the basilica offers you the second highest view point over Paris, after the Eiffel Tower. From this point, you can observe almost all of the city: the Eiffel Tower, the Arc de Triomphe, the Montparnasse Tower, the Panthéon, La Défense…and so much more. 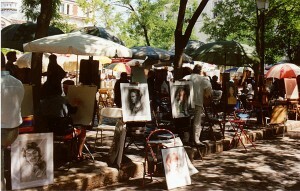 You can wander in the streets all by yourself to feel the atmosphere, but do not fall in the trap of only going to the basilica and to the place du Tertre, the famous square where painters sell their artworks and offer to draw your portrait. There is much more to see! At ParisByM, we include a self-guided walking itinerary in our packages so that you are sure not to miss what is worth seeing. Check our packages here. 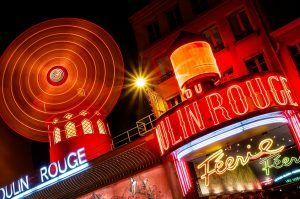 With its bohemian atmosphere, Montmartre is also the place of birth of the first and most famous cabaret in the world: The Moulin Rouge. Even though it may seem pretty touristy nowadays, we still highly recommend that you spend an evening there as the show is definitely a must-see of Paris. A sunny day at one of our city’s many markets. If you prefer a guided tour, the most interesting one we recommend is the 2-hour tour, available in various languages, and divided into small groups. If you love art and music, this is your place! Should you really want not to miss a single bite, you could also take a 7-hour tour in Montmartre, but we only recommend that for experts… You will have the chance of learning every single detail of this curious “village” and its neighborhood lifestyle. In addition, the basilica offers many different activities during the day. You can take a look into the chart of services here. Hours: Sacré Cœur opens every day from 6 am to 10.30 pm.